The holidays are over and most of the holiday goodies have been consumed. Now is the time to start taking care of your body, instead of continuing to indulge. I don't know about you, but I thoroughly enjoyed indulging – chocolate, cookies, candies, sweet potatoes made with brown sugar and cream, a little wine, a little champagne... the list goes on. Most people put on a few pounds during the last two months of 2011. So join me, kick off 2012 by taking care of the rest of your body instead of indulging your mouth. It's easier now that we are SATURATED. It's also easier to choose healthier foods after New Year's Day than it was just before Thanksgiving. No big temptations until the Super Bowl. Lastly, your body is more willing to release the grease, i.e., burn some fat, since your pineal gland can sense that the days are already getting longer and you're not going to need the extra pounds of insulation to keep you warm for eternity. Spring is coming. This is what I have every patient try when they come to my office. It is a place to start learning how food affects your body. Food isn't just nutrients. It's information for your genes. Good foods turn on good genes and turn off dangerous genes. Eating the best foods for your genes will keep you from getting diabetes or hypertension that runs in your family. In a sense it is easy: cut out all wheat, dairy, corn and sugar. But when you start looking into what contains these four ingredients, you will eliminate almost all processed foods. It eliminates almost all baked goods. It eliminates cheese, milk, and creamy sauces and some salad dressings. Cutting out corn eliminates popcorn, tortillas, and many processed foods. Lastly eliminating sugar cuts out all the treats and table sugar. The reason to do this is that wheat, dairy and corn are highly sensitizing. They may also cause food allergies, but food sensitivities are subtler and are frequently associated with chronic complaints such as fatigue, food cravings, weight gain, joint pain, chronic sinus drainage and irritable bowel symptoms. Again, food is information for your genes. Do some detective work and find out what information the food you are eating is feeding your genes. Is your food turning on genes that increase your weight? You will never find out unless you eliminate these foods for two weeks. You can do it piecemeal: Eliminate wheat for 2 weeks, then dairy for 2 weeks, etc., but each of these foods has a greater effect on your body when combined with the other foods. You will see much greater results if you eliminate all 4 food groups at the same time. What follows is a handout I give patients in my office. Read it carefully. If you decide to take a risk and do it, recognize that it will probably take several days to get into the routine. And, that's okay. The goal is to go two solid weeks without wheat, dairy, corn and sugar and then every 72 hours reintroduce one of these foods. You just might find a major key to losing weight and optimizing your health. Bon Appétit! The Elimination Diet is a dietary program designed to clear the body of foods and chemicals you may be allergic or sensitive to and, at the same time, improve your body's ability to handle and dispose of these substances. We call this an “Elimination Diet” because we want you to remove certain foods and food categories from your diet for two weeks. The main rationale behind the diet is that these modifications allow your body's detoxification machinery, which may be overburdened or compromised, to recover and begin to function efficiently again. These dietary changes help the body eliminate or “clear” various toxins, including these specific foods, that may have accumulated due to environmental exposure, cigarette smoking, and the consumption of drugs, alcohol, or over-processed and/or genetically modified foods and beverages. In our experience, we have found this process to be generally well tolerated and extremely beneficial. There is really no “typical” or “normal” response. A person's initial response to any new diet is highly variable, and this diet is no exception. These differences may be attributed to physiological, mental, and biochemical differences among individuals, the degree of exposure to certain types of “toxins,” and other lifestyle factors. Most often, individuals on the elimination diet report increased energy, mental alertness, decrease in muscle or joint pain, and a general sense of improved well being. However, some people report initial reactions to the diet, especially in the first week, as their bodies adjust to a different dietary program. Symptoms you may experience include changes in sleep patterns, lightheadedness, headaches, joint or muscle stiffness and changes in gastrointestinal function. Such symptoms rarely last for more than a few days. A food and symptom diary is kept while on the Elimination Diet. Monitor your temperature, your urine pH (optional), and check your weight every day. • Write down what and when you eat each day. Make a note about how you feel (physically and emotionally). • Take your temperature as soon as your alarm clock sounds (before you even roll out of bed). • Record your weight after your morning bowel movement and urination. After a period of two to three weeks, foods that have been avoided can be carefully re-introduced while keeping a diary of symptoms. This re-introduction of foods is called the “challenge phase” of the Elimination Diet, and will be discussed below (see CHALLENGE PHASE). YOU'RE NOT GOING TO STARVE! WHAT DO I GET TO EAT TOMORROW? • Eggs and veggies! One or two boiled eggs, an omelet or egg-scramble with two to three egg whites and one to two egg yolks, with spinach, onions and mushrooms. • Fruit and nuts! Blueberries, strawberries, blackberries, or apple slices with a small handful of pecans, almonds or walnuts. • Leftovers! Protein and veggies from the night before make a great breakfast! • Large salad with lean meat/beans/nuts and your choice of dressing (so long as it is devoid of sugar, wheat, corn or dairy), plus one piece of fruit. • Two or three servings of cooked or raw low-calorie above-the-ground veggies, one serving of lean meat/poultry/fish/beans & nuts, and one piece of fruit. If you are stuffed after eating your protein and veggies, you can eat your fruit later on. • Fruits and nuts are great snacks (one handful of nuts per day). Stick to berries and apples. WHAT SUPPLEMENTS DO I TAKE? The Elimination Diet minimizes your intake of starches and sweets, so it is imperative that you take appropriate nutritional supplements. This is especially true of magnesium, which will be washed out of your body in your urine by the moderately high protein intake. You also need to be on a GOOD multiple vitamin to get adequate vitamins and minerals: especially vanadium, chromium, manganese, and zinc. These help minimize carbohydrate cravings. A large percentage of the U.S. population does not get enough of the recommended daily allowance (RDA) of magnesium, though, according to many experts, even the RDA is too low to take full advantage of magnesium's powerful benefits. Reputed to be the "antistress" mineral, magnesium has been found to help ward off the formation of blood clots, lower blood pressure, prevent complications related to diabetes, assist in maintaining bone strength, and contribute to greater life expectancy by reducing the risk of heart disease and by limiting the effects of free radical damage. Additionally, we recommend the use of magnesium during the Elimination Diet as a natural sleep aid and to assist with regular bowel movements. Constipation: 2-3 pills of Magnesium Oxide 400mg at bedtime. If you have sleep and constipation issues, you may need both forms of magnesium. The only side effect of too much magnesium is diarrhea. If this happens, cut back. WHAT PORTION SIZE IS RIGHT FOR ME? Your portion of fish, poultry, beef, or vegetarian proteins will be the size of your palm (not your hand). To clarify, the length, depth and width of your palm define the appropriate serving size of protein for a meal. A proper fruit serving is the size of your fist. Low calorie veggies are unlimited in portion size. One half of your plate at each meal should be covered with these veggies. You can have as many, and as often, as you want. Choose carbohydrate sources with a low glycemic index (glycemic index measures the ability of a food to raise your blood sugar). A good rule of thumb is that most non-starchy vegetables and fruit will measure low to moderate on the glycemic index. These foods are also rich in alkaline minerals and soluble fiber. While fresh, uncooked vegetables and fruits are especially good, frozen fruits and veggies can be used. Try to avoid canned vegetables. Also avoid canned or frozen fruit with added sugar. Avoid “junk foods” (cake, candy, cookies, etc.) and everything processed with High Fructose Corn Syrup. Most cereals, breads, pastas, crackers and starchy vegetables (i.e. potatoes, corn, limas, peas) and very sweet fruits (i.e. bananas, dried fruits, orange and other juices) or too many grapes may raise your blood sugar too high, especially during an elimination diet. 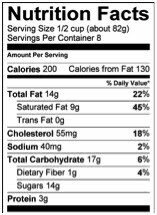 A quick way to determine if a food qualifies as having a low glycemic index is by looking at the label. Simply add the Fiber and Protein grams together and then subtract this total from the Total Carbohydrates. If the difference is less than 10, then you have a low glycemic food. Thirteen is greater than ten, so this would NOT qualify as a low glycemic food source. Go to www.calorieking.com to see nutrition facts on all sorts of foods. Choose protein sources that are low in saturated fat. Saturated fat directly contributes to higher levels of arachidonic acid, which promotes inflammation (see FAQs). Your best choices of protein are lean cuts of meat, fish, poultry, and legumes. Choose fat sources high in healthy fats such as seeds, nuts, vegetable or olive oils. Taking a high-quality fish oil supplement (such as Omega 820 by Xymogen) helps to make sure you have healthy fats in your body. Avoid trans-fatty acids such as those in margarine, processed foods, regular peanut butter, baked goods and vegetable shortening. Avoid lard and butter; however, if you really enjoy the taste of butter, you may use clarified butter (also known as ghee), which is not pro-inflammatory. For the rest of your life, emphasize fresh veggies (such as a big salad) as a part of at least one meal per day. Dr. Vaughan recommends that at least 50% of your food intake at lunch and dinner consist of low calorie, healthy vegetables. Optimally, whole fresh foods that are organic and contain no genetically modified ingredients are the best foods for your genes. Choose organic, range raised, hormone and antibiotic free eggs, beef, dairy, and poultry. This will minimize, but not completely eliminate, your exposure to environmental toxins. • Always intend to balance protein, carbohydrate and fat at each of your three meals. Snacks of any of the allowed foods may be eaten during the day also. • Eat slowly, and stop eating when you are full. If you have to “clean your plate,” then use a smaller plate! When preparing food, raw is almost always best when preparing fruits and vegetables; however, they may also be steamed, grilled, broiled, baked, sautéed, microwaved or poached. Avoid deep fat frying completely. After two to three weeks, you may begin to carefully re-introduce eliminated foods into your diet. Weigh yourself in the morning and then go out to lunch (or breakfast, or dinner) and have whatever you have been missing the most. Eat a BIG serving of it! Maybe it's wheat bread, pasta, corn, milk, or cheese. Challenge yourself with the one “forbidden food” that you've missed the most. Don't have macaroni and cheese, or a wheat bread sandwich with cheese and ham. Choose ONE item that you really want, and challenge yourself with that item. Eat other foods that you know are okay for you. WARNING: Don't do this before an important presentation or meeting! You may experience all kinds of symptoms within 30 minutes to 4 hours. Some symptoms may develop over the next 24 hours. Just observe what happens, make notes in your journal, and take your morning temperature, weight, and urine pH (optional). Symptoms can vary depending upon a number of variables including age, the type of allergen (antigen), and the amount of food consumed. Outside of an elimination-type diet, it may be difficult to associate the symptoms of an allergic reaction to a particular food because the response time can be highly variable. For example, an allergic response to eating shrimp will usually occur within minutes of consumption, often taking the form of a rash, hives, asthma or a combination of these symptoms. In contrast, the symptoms of a sensitivity reaction to cow's milk may be delayed for 24 to 48 hours after consumption; these symptoms may also be low-grade and last for several days. If this does not make diagnosis difficult enough, reactions to foods made from cow's milk may also vary depending on how it was produced and the component of the milk to which you are sensitive. Note: The weight gain that you may experience isn't due to the calories in the single serving of the forbidden food. It's due to your body trying to dilute out a toxic food by retaining water weight. The symptoms indicate either: 1) a true allergic reaction or 2) a toxic reaction to the reintroduction of a food that your body doesn't like. Re-challenge yourself with another single food every 3 days. That will allow your body to recover from the first reaction/exposure completely. Keep good records of your reactions so that we can discuss them at your next office visit. It's not that you'll never be able to eat wheat, or ice cream, or some other “forbidden food” ever again; rather, you WILL realize that YOU ARE WHAT YOU EAT. Maybe wheat (or dairy, or corn, etc.) won't bother you, and you can eat it more frequently. If it does cause symptoms, though, you'll be able to decide when, where, and how much wheat you want to eat. You may choose to eat an open-faced sandwich once a week, but choose not to have a regular sandwich every day. Try this and simply do your best. If you “lose it” one day, just pick back up where you left off, keeping in mind that it takes about 72 hours for your body to completely detox from one day's consumption. If losing weight is one of your goals, you'll be happy to know that most people will lose 5-15 pounds without any drugs using this approach. If you exercise, you'll lose more weight. If it just doesn't work for you, then Dr. Vaughan will individualize your program more specifically at your office visit. 1. Do I have to eat this way forever? No. This is a short-term diet to identify food sensitivities. Later you may be able to liberalize your diet. 2. When can I eat a REAL sandwich? Next month. 3. I hate eggs! Consider a protein shake or bar (we have a great selection at NVC, (The Natural Vitality Center), leftover beans, chicken, turkey, steak, or salmon from the night before, or some nuts with fruit. 4. What is inflammation? Inflammation is the process that makes us get older. It causes hardening of the arteries, the redness around a cut on our arm, and arthritis. People who have obvious inflammation (such as those with Coronary Artery Disease, Multiple Sclerosis, Rheumatoid Arthritis or Lupus) should avoid as much saturated fat as possible. That is, they should not eat any cheese, fatty beef, or ANY pork. They should limit their use of oils to olive oil, ghee, coconut oil, flaxseed oil, borage oil, black currant seed oil, and hemp oil. All other vegetable oils should be avoided. Egg yolks and high fat dairy products should also be avoided, since these are pro-inflammatory. 5. What are the best foods to reduce inflammation? Coldwater fish including trout, salmon, anchovies and sardines all have good, anti-inflammatory fats in them. Walnuts and flax seeds also have fats that are anti-inflammatory; however, these need to be enzymatically converted to the better fats that are already found in coldwater fish. Some individuals' bodies are unable to do this efficiently. Therefore, we recommend that everyone eat a minimum of one to three servings of coldwater fish per week, or take a fish oil supplement containing high levels of EPA and DHA. 6. What about mercury poisoning from eating all of this fish? This is a very real possibility if you eat shark, tilefish, king mackerel and canned albacore or fresh tuna. Avoid these. For more information go to the FDA website: Mercury Content in Fish. The safest fish come from Alaska. A. Spaghetti - Put some organic tomato sauce (check your ingredient list first) on top of some steamed veggies or rice pasta. Dr. Vaughan recommends Tinkiyada Rice Pasta. B. Pizza - You are right. You can test it two weeks. C. Hot Dogs - If you want an occasional all beef hot dog, eat it. Remember, though, that this is a lifestyle change. Processed foods are less healthy than whole foods. We recommend leaving off the bun. Or eating a gluten free bun. D. Chocolate Cake - If you are a chocoholic, you must take the magnesium supplements! Chocolate cravings often indicate a magnesium deficiency. Try a small piece of very dark chocolate instead. E. Beer/My Daily Martini/My Glass of Red Wine - You are right. It's a sugar. Alcohol is not on this diet initially. Alcohol slows down your metabolism in addition to giving you a lot of empty calories. So, short term, no alcohol of any kind. Long term, there will be room for alcohol occasionally. F. Butter - Clarify your butter by taking a pound of unsalted butter and heating it to a slow boil for about 20 minutes. You may need to skim off the foam from the surface. The clear liquid portion (called ghee), which rests above the milk solids that sink to the bottom, is perfectly good to use for flavoring or cooking. Pour off the ghee and store either in your refrigerator or at room temperature. Discard the milk solids. Ghee does not raise your cholesterol and is not pro-inflammatory. G. Biscuits at My Favorite Drive-Thru - There is no room in this diet for biscuits. However, if you are caught in an absolute pinch, go by McDonald's and get a plain Egg McMuffin® (with no cheese, ham, or sausage). Throw away one of the slices of the English muffin. Figure out how to avoid this in the future. H. Cheese - Cheese and most dairy products are excluded from this diet for two reasons. 1) Cheese has a lot of “bad fats” in it. In all honesty, cheese should probably only be used for seasoning as opposed to an entire meal. 2) Many people do not realize that they have dairy allergies. If you exclude dairy foods from your diet for two to three weeks and then start reintroducing them, you may notice some subtle allergic reactions within 4 to 72 hours. I. Bread and Pasta - The same holds true for breads as it does for dairy products. Many people have wheat or corn allergies and do not recognize that their symptoms of fatigue, brain fog, heartburn or weight gain are due to their consumption of pasta, breads and cereals containing wheat or corn. Also, breads are much more highly refined than whole grain cereals and tend to raise your blood sugar quite rapidly. These should be avoided for the duration of your Elimination Diet. The same goes for chocolate cake as it does for hot dogs, pizza, and many other things on this list. If you are in a situation and you really, really, REALLY want it… then go ahead and eat it. Enjoy it immensely! Watch for allergy or other toxic symptoms afterwards. Do not beat yourself over the head. Get back into your routine the next day. You can always have anything you want, but if you eat too much of everything you want, you won't lose that weight (if applicable) or feel your best. What's more important to you -- THAT chocolate temptation or taking care of the only body you're ever going to get? This is a lifestyle change. You want to learn to accent your life with these wonderful foods and not eat them every day. Lastly, have fun with this. Think of this as a game. Discover what foods nourish you and what foods deplete you. You may unlock the door to treating whatever stubborn symptoms you have that no one could fix with a drug. And you may win the biggest prize of all: Unlock your door to getting healthy and younger.